Instant access to deposition testimony. Realtime gives you the ability to review testimony as it happens and adjust accordingly. Whether it’s an incomplete answer that needs a follow-up question or an objection that can be remedied, realtime helps you make the record you need. Highlight, issue code, and annotate text throughout deposition. Import directly into your case management software with annotations and highlights. Walk away from the deposition more organized, giving you a head start. 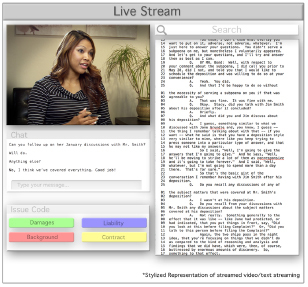 Give clients, experts, co-counsel, and staff live feed of deposition video and transcript. Remote viewers can give feedback and suggest follow-up via secure chat. No software to install; quick, easy to use interface.